Dive online into the latest statistics for the Home Appliance Industry in Europe! With the new APPLiA online report, you can dive into the latest statistics for the Home Appliance Industry in Europe. You will find that a stunning effort has gone into maintaining the industry’s Home Appliance 2025 vision and call for action. “During 2017, our members have worked hard to develop new and innovative technologies that help everyone in Europe lead more comfortable, sustainable and healthy lives”, stated Paolo Falcioni, APPLiA Director-General. The APPLiA members have continued to provide valuable contributions to the European economy, to smarter and better EU regulation for the sector, to advancing sustainable lifestyles for EU citizens and to further developing smart(er) living in a connected home environment. But 2017 has not only been a fruitful year for the members it has also been an exciting year for the association as they went toward a new corporate identity. 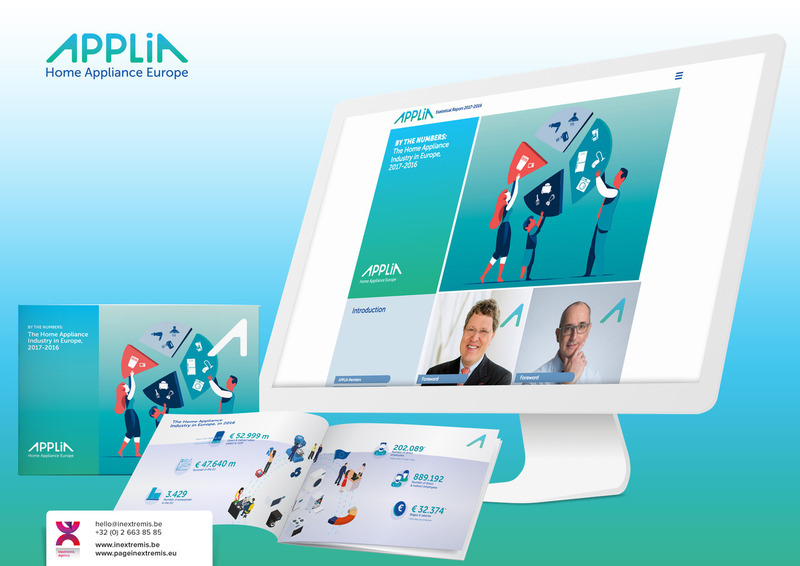 "With the release of this report, CECED has become APPLiA", added Paolo Falcioni, “ You will find a first look of our new identity in the following pages. I am sure you will enjoy the read”. The APPLiA Director-General closed by declaring: “ In the meantime, we welcome any feedback you may wish to send us in response. Our door continues to be open! The 2017-2016 online edition of the Home Appliance Industry in Europe by the numbers report compiles robust facts and figures about the industry. The Communication Agency, Page in extremis is proud to have contributed to the creative development and the graphical production of the online report. The result is a comprehensive digital publication made within an intimate original dialogue framework involving the Belgian communication agency’s creative team, and APPLiA. Page in extremis has defined a very accurate process including monitoring and quality check particularly suited to provide maximum comfort to its clients and the best results. Interested in partnering with Page in extremis? Based in Brussels, the communication agency makes associations brands conversational, helps organisations engage with their stakeholders and convey their messages. “The Reputation Institute estimates that most organisations have an average of eight key audiences that are crucial to their success. These could be: customers, intermediaries or retailers, commentators and experts, media, staff, Government, regulators, suppliers and business partners” Langham, Tony in Reputation Management (PRCA Practice Guides).